Syrabane's Grip - Both weapons, both shields, three pieces of jewelry. Weapons should be precise or infused (precise preferably) with spell damage enchant on the front bar, crusher enchant on the back bar. Shields should be infused with health or tri-stat enchants. Neck arcane with spell damage enchant, rings arcane with shield play enchant. Knight Errant/Leeching - Knight Errant preferable. All body pieces; chest, legs, waist, hands, feet. Chest and legs should be infused with tri-stat or health enchants. Small pieces should be infused or sturdy with health enchants. Swarm Mother's monster set - Either both pieces light or head med shoulder light - Infused head/Infused or Sturdy shoulder - Health enchant. Note on traits - I prefer infused since Morrowind patch on all my tanks because of the sheer amount of damage newer dungeon and trial bosses dole out. I also plan on testing this build with equilibrium, because it is such gold on my standard tank rendering my sustain infinite, I want to see if this build can swing it. As it stands this build works fine in dungeons as is. If you use this build and feel like you're struggling with stamina consumption, feel free to insert sturdy items where you need to. Note on enchants - I HATE tri-stat enchants. They're expensive with no real bang for the buck to me personally. I never use them, never had to. If you live and die by hakeijo, then by all means break your bank. The race I consider best-suited for this build is Redguard because the race passives afford a quick way to rebuild stamina. This is not a purely magicka build, but it creates something similar to what saptanks once were in the past; healing/killing/tanking beasts of yore. The idea of this build is to balance stamina/magicka consumption with spell damage. 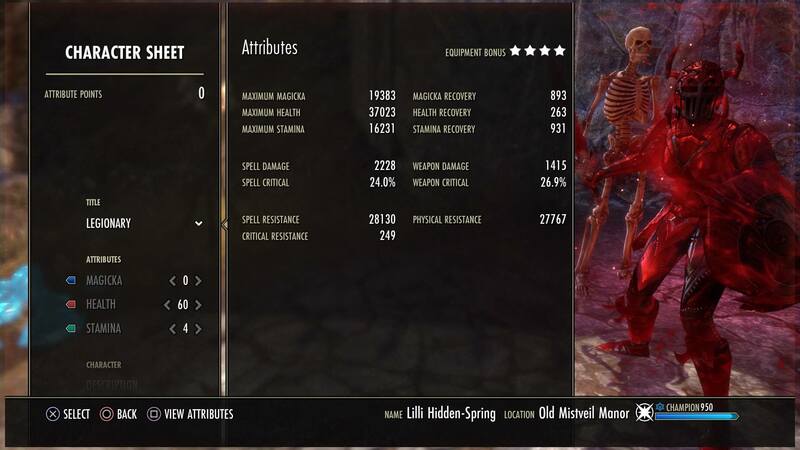 I use Syrabane's Grip because of the awesome amount of magicka return it provides. In trash mobs my magicka bar is always full. This set is superior to Seducer because cost reduction pales in comparison to a limitless amount of magicka. Boss fights with no magicka damage is a bit tricky but this is where the larger magicka pool comes into play with shards or orbs from the healer. Equilibrium is also an idea I'm toying with but haven't implemented to date. Knight Errant is superior to Leeching as well as to Bahara's Curse because the health return is guaranteed instead of based on chance because of how much as a tank you spam Pierce Armor and Heroic Slash. The exra weapon damage doesn't hurt either. Leeching strikes and heavy attacks (especially with the race passives of Redguard) ensure you'll never run short of stamina when you need it. The ulti from sword and board comes to the rescue when you simply MUST heavy attack in a bad situation. Precise weapons and damage enchants are included to boost magicka damage, so your saps actually sap. With the enchants and apprentice mundus stone, once you kick your saps in and gain major sorcery, your spell damage should be roughly 2100 to 2500 which is enough to cause some damage and provide some heals. Note that I use Structured Entropy on the front bar for the 8% extra health and a much less expensive way to get the attention of faraway enemies so they can get pulled in by Swarm Mother. It's also an inexpensive damage ability on boss monsters that returns occasional health. Structured Entropy isn't a requirement and it fills a flex slot. I like the 8% extra health so much I usually keep it there. Note that I use Shades with this build so I can free up my main bar's weapon enchantment to increase my own damage. No use in using a Weakening enchant when the shades do it for me. I'm not the best at theory-crafting or calculation of numbers. I'm sure my build is filled with holes and horrible mistakes I haven't considered. I've just had a lot of fun with this build and decided I would share it. In normal dungeons I can solo, I swap my shades for siphoning and get it done. In vet dungeons I haven't encountered a problem. Even when the healer is lackluster and I have to fend for myself. I've never taken this build into trials probably because I would be laughed out of one. So it's not trials tested as of yet. I'm still considering ways I can boost my spell damage and crit so this build is a constant work in progress. In the screenshot I'm not using precise weapons, so my crit is atrocious. I'm working on acquiring them. Note on CP - This is for a 690 cp Bosmer. You'll need to adjust The Lover according to what your race passives lack. As a Bosmer I lack magicka regen but I have innate stamina regen so I need nothing in mooncalf. You may need to allocate some points there. Update – I reworked my attribute points and allocated 24 into magicka, the saps just can’t hold up unless there is a stupid amount of magic damage hitting you. Some mobs keep my bar full and other mobs that have more of a physical/magical mix can’t keep my sustain at a place I need it to be. I also exchanged one shield play enchant for magicka regen and I’m using Jewels of Misrule food to test it out. I use regular max stat food in vet dungeons because I need the max stamina. I’ve decided I’m going to post a more refined version of this build with more info like passives I find useful. I’ve been working with this tank more and more lately. I’ve increased my spell damage to 2800 and use 2 light 5 heavy now, my health is between 32 and 35k depending on which bar. I use 2 sturdy pieces on the body to make up for lost stamina with the extra attributes in mag. I’ve also been vacillating between bloodthorn and syrabane. Bloodthorn is useful in dungeons with more physical damage mobs and bosses. Jewels of misrule is good paired with bloodthorn. Regular max stat is good with syrabane. I still prefer and recommend syrabane over any set, including bloodthorn. I just thought I would do some comparison testing and it’s not bad plus it’s available in good traits more often than syrabane. Syrabane works better but bloodthorn will suffice as filler or if it fits your playstyle better. I also completed my knight errant set and it is much better than leeching and bahara, it’s far superior to the two. With 2800 spell damage and 22k magicka, my tank is sappier than ever. This is the closest I’ve come thus far to reviving sap tanking the way I used to play it. Hey dood, I’ll be giving this build a go. Hope it works out well (don’t have the assault skill line yet lol. might get it soon). Great build! I know you mentioned you were going to post a more refined version, is that still going to happen. Really enjoying this setup.